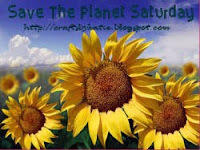 Welcome to the first ever Save the Plant Saturday! As part of my goals for this blog and for my life, every Saturday, I'm going to post a tip here on helping us keep our planet healthy. Now, quite often, those same tips will also help in the organizing of our homes. My first tip has to do with magazines. Now, if you're like me, you loooove magazines. You love the look of them, you love the feel of them in your warm little fingers and you love flipping through them. I confess that I have a subscription to Better Homes and Gardens and I have tons of scrapbooking magazines. I don't have a subscription to those anymore but I still have tons of old issues from when I did. Have you ever noticed how what starts out as just a few magazines here and there suddenly and mysteriously develops into magazines everywhere you look? One of the first and often easiest things to tackle when you're going to start an organization project in your home is that very forest (and perhaps that's not quite an exaggeration since they're all made of paper) of magazines. I always find it easier to go through them once and immediately remove any that I know I don't want anymore. I often find I have 3 piles: keep, don't want, unsure about keeping. Once I go through and divide them into those piles, I then go back through the unsure pile and make those tougher decisions. Now, what do you do with all of those magazines you no longer want? Well, you have a few options. You can put them into the recycle bin, of course. You could also throw them away but that would be bad and the Gods of Taking Care of the Planet would frown down upon you. My favorite suggestion though is to donate them. The first thing I do is to contact my children's school. Quite often their teachers or the school art teacher are looking for magazines that can be used for art projects. If they don't want them, call around. There are programs out there that use old magazines to teach English. Heck, if you run out of ideas, check your local laundromat. I know that the one by where I used to live loved to have people drop off old magazines for people to flip through while their laundry was spinning round and round. So, before you just toss those old magazines for recycling, check and see if anyone else would like to reuse them. Remember that it takes energy to recycle those magazines and it's far better to give something an extended life than to just drop it into a recycle bin. Thank your kids for their $10 donation. My daughter gave up her itunes allowance. Her ipod touch is still new (from Christmas) so this is a pretty big sacrifice for her too! I will match their funds. Katie, Thanks for the sweet words on my blog. I was "thisclose" to giving up. I was really discouraged. Anyway, I recycle my magazines by using them in my altered art pendants! this is a wonderful idea! I would love to join in next week!